ACTUARIALPOSTJOBS delivers a targeted jobsite in a unique manner that is unlike any other Job Board in the actuarial marketplace. Our parent site, Actuarial Post, has quickly made a reputation as one of the leading websites in the actuary field that is viewed daily by over 38,000 actuarial professionals looking for industry news, press releases and of course new career opportunities. The popularity of the Actuarial Post Job Board has prompted us to give the site its own distinct identity that allows recruiters a unique opportunity to have their jobs seen by the largest pool of potential candidates worldwide. Recruiters are able to reach quality candidates at every level, including those traditionally hard-to-fill roles. We do it by focusing exclusively on the actuarial market and the professionals working within it and ensuring that the Jobs website is linked to the daily updates from the parent site to ensure that we stay relevant every DAY. We carry vacancies across all types of job function, experience, location and industry sector and attract the best match candidates in this way. Needless to say our professional approach and attention to detail will ensure that you will be guaranteed the best service that we can offer in order to deliver targeted and well-run campaigns that will ensure your adverts will land on relevant candidate’s desktops. This market focus plus our experience and technological know-how make ACTUARIALPOSTJOBS an obvious first choice in the fiercely competitive actuarial recruitment market. 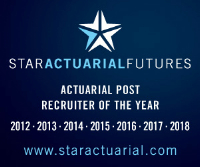 To complement our Job Board ACTUARIALPOSTJOBS also produce the Recruitment section for the Actuarial Post Magazine and also produce a weekly ACTUARIALPOSTJOBS Newsletter which will be sent direct to the desktops of over 38,000 actuarial staff across all job titles. The strength of this approach demonstrates a serious commitment to our customers and allows us to provide an exceptional service for both actuarial professionals and recruiters alike. We have an exceptionally high level of recruitment experience within the ACTUARIALPOSTJOBS recruitment team and a thorough understanding of the issues at work in the actuarial environment. It’s a powerful combination that helps our account teams understand and meet the needs of recruiters searching for quality candidates and actuarial professionals searching for their next career move with equal success. Everything ACTUARIALPOSTJOBS offers is designed to make the process of recruitment as straightforward, quick and effective as possible. Our products range from simple job posting to branding opportunities, applicant tracking and screening tools. Our account team are is on-hand to help recruiters choose the best packages for their business needs.